Apple has released iOS 11 beta 5 to the public developers for testing purposes. In a way, iOS 11 is quite approaching and will be released in September alone with new iPhone 8. According to Apple’s release notes, in the fifth beta, iCloud Messages has been removed. Apple plans to reintroduce it in a future update to iOS 11. Today’s beta fixes AirPlay, and tapping the AirPlay button in videos that are not full screen will no longer crash some apps. There’s also a fix for a Calendar bug that could cause crashes when dragging items into the Calendar app, and FaceTime Live Photos is now an option that’s enabled by default. What’s new in iOS 11 beta 5? – Messages in iCloud – Apple’s iCloud Messages feature, which allows iMessages to be stored in iCloud to free up space on an iOS or Mac device, has been removed in iOS 11 beta 5. 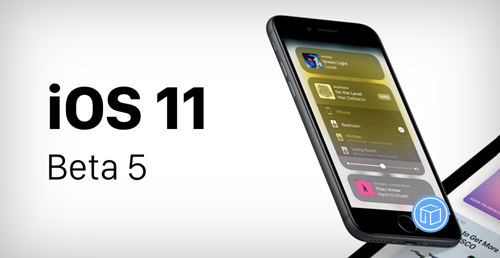 Apple says the feature will be re-released in a future update to iOS 11, suggesting there are no plans to add it back to the version of iOS 11 that will launch in September alongside new iOS devices. It’s not clear why the iCloud Messages feature has been removed or exactly when it’ll come back, according to MacRumors. – Control Center Music Icon – The Music app in the Control Center has been redesigned with a new pulsating indicator that lists nearby audio sources like AirPods, speakers, and AirPlay devices. When the indicator is tapped, it opens up a list of sources that can be quickly selected, making it easier to connect to audio devices or AirPlay content to a television. – Settings – The icon for the Settings app has been tweaked. Instead of a gray background, it has a black background, making the gears more prominent. – Camera – The icon for the Camera app has also been subtly tweaked, introducing a simpler design that does away with the two lines that used to be present. – Screen Recording – When recording your iPhone or iPad screen, the indicator bar that lets you know recording is taking place is now red instead of blue, making it more prominent. This entry was posted in iOS 11, News and tagged iOS 11 news by IosdroneD. Bookmark the permalink.